Hi everyone (anyone) that is reading this first blog post for Early Rise Outfitters, thank you for reading. It’s mid-summer, and the fishing is on fire! Lately I have split my time fishing for trout, and hunting down big largemouth bass from shore and in a kayak. The lack of rain that we are all experiencing has had an effect on the local lakes, ponds, and rivers that aren’t tailwaters. Thankfully I am just down the road from Massachusetts finest trout fishing tailwater, the Swift River. It was a cool night and morning, hitting its low of 55°F when I arrived. I only had two hours to fish, but it didn’t take long to get some beautiful, healthy trout into my net. The water flow is high around 130cfs, nearly twice the normal flow, and the fish are quick to use it to their advantage making hard runs against the current, instinctively pulling away from my waiting net. A few fish were lost during the fight, one broke my tippet, but most were handily subdued and quickly released. By the end of my time, I had landed 8 Rainbow Trout, 4 Brook Trout, and 1 Brown Trout. Nymphing is my go-to technique 99% of the time. I find it hard to argue with consistency, and that’s how I fished today. If you are nymphing soon, remember these two things: ‘Get it Deep’ – make sure you are as deep as you can fish without getting hung up, and ‘Hooksets are Free’ – set the hook any time you see your strike indicator do something different. 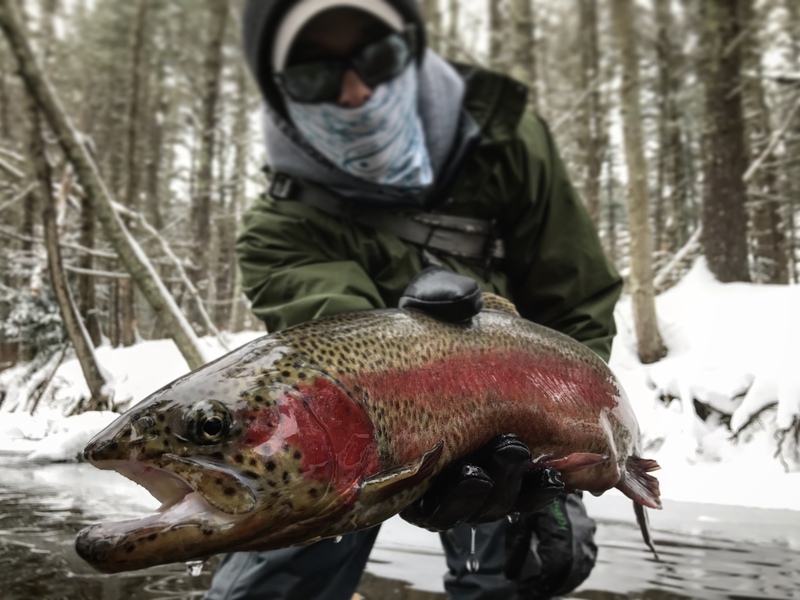 Trout that are highly pressured will oftentimes be able to bite-and-reject your fly before the indicator has had a chance to go under. I can’t count the number of fish I have missed by lightly lifting my rod attempting to gently free a snag, only to see a trout roll and spit my fly. Setting the hook often will give you the on-the-water experience needed to identify the most subtle of strikes, increasing the number of fish you catch dramatically. Thanks again for reading this first post. I will be posting more and adding new content to them as we go. If there is something specific you would like to see discussed, please comment and let me know. If you or anyone you know enjoys a fun day wading and catching trout, please contact me at Patrick@EarlyRiseOutfitters.com to book a guided fly fishing trip; you won’t be disappointed. If you are fishing soon, I wish you tight lines and a safe trip. Nicely written , thanks for the info . Congratulations and good luck in your new venture. I have no idea what any of this means, but first blog post? Woohoo!